On Friday, Facebook gave the world an early Christmas gift with its new messaging system called ‘Poke’ – a play off Facebook’s “Poke” function. This new app gives users the ability to send complex messages like text, photo or video, but the messages are similar to the Snapchat services, in that the messages are real-time and only available for a few seconds. The Poke messages can be sent to individuals or a group and they’re only visible for up to 10 seconds. Snapchat, the service similar to Poke, has been steadily growing in popularity since its launch in 2011. Last week, the service reported that more than 50 million messages went through its site in a single day. However, the time-limit life-span for each message has given Snapchat a reputation for making it easy to send graphic or inappropriate message, as those messages quickly perish soon after they are sent. Facebook’s Poke app is currently a free download available on the iPhone, and it adds to Facebook’s growing mobile application portfolio, which includes Facebook Messenger, Facebook camera, and Instagram. All of this mobile attention comes for good reason: comScore reported in May that Facebook users spend more time on Facebook through mobile devices than through computers. 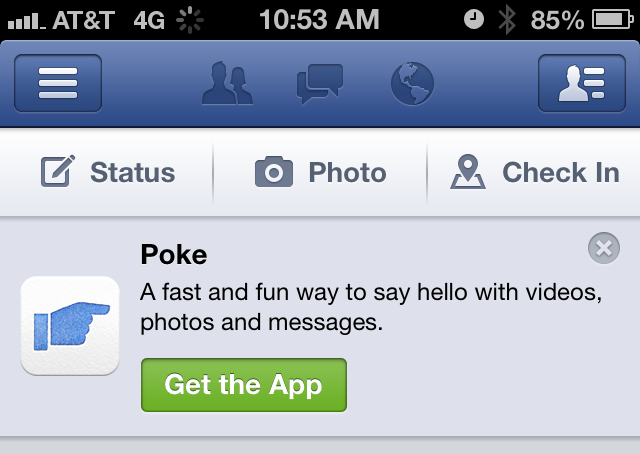 Clearly, we can expect Facebook to continue creating and optimizing their apps over the next year. We’ve already seen examples of this behavior with Facebook’s recent release of native versions of their apps for Google’s Android and Apple’s iOS operating systems. As a parting note, some users have expressed concern about Facebook’s Poke app, as it can potentially increase spam by allowing users not to disengage from the message. The person receiving the message has only a short amount of time to report it, otherwise it’s deleted.